Originally published in 2015 for use with Paizo Publishing’s Pathfinder Roleplaying Game—the descendant of Dungeons & Dragons, Edition 3.5—in June, 2016, the adventure The Demon Stones – A medieval-fantasy roleplaying adventure for 4 characters of levels 4 to 5 was re-published for use with Mythmere Games’ retroclone, Swords & Wizardry. It comes courtesy of Glynn Seal, better known for his artwork and cartography, and is published through his own company, Monkey Blood Design. It is an adventure for a party of four or more characters of Levels Four and Five. It combines investigation with wilderness adventure and a decent dungeon and comes more than very well appointed with counters to use on the tabletop and players’ maps as well as for the DM. It begins with the player characters being approached by a dwarf, Rhuin Graystone, and hired to travel to Hoarwych Valley and the village of Gravencross. Once there, they are to protect some stones that have ‘fallen from the sky’. What the player characters will have already heard is that the stone are said to be demonic in nature and the valley is said to be suffering some sort of curse as a result. Nevertheless, the dwarf is paying handsomely and these are only rumours. Travelling to Gravencross, the party discovers that the curse is actually a disease called ‘Wychblight’, that is afflicting crops and animals alike. They will also learn the location of the first ‘demon stone’ and upon investigation in the village, what the inhabitants think about this and that. Following up on these opinions and rumours leads the adventurers to one or two oddities in the village, though what they mostly learn is the location of the first of the fallen stones. This leads to the next stone and the next, hinting at something else going on in the valley, and eventually to the true source of evil in Hoarwych Valley. The Demon Stones feels more northern European in tone and style. This is no surprise given that the author is English, but this tone and style also echoes the dungeons and adventures published by TSR UK as the UK series of modules, in Imagine magazine, and subsequently GameMaster Publications magazine. There is a also a vein of horror running through parts of the scenario, though one that owes just a little to the Hammer horror movies. So there is a grimness to the scenario and there is also a decent bait and switch to its plot. The plot itself is essentially straightforward enough and not necessarily all that interesting. This carries over in terms of design as the scenario does feel fairly traditional and its mix of treasure feels more randomly placed than by design. Further, and despite it having been rewritten for use with a retroclone like Swords & Wizardry, it still feels like an adventure written for a more complex iteration of Dungeons & Dragons. Which given the tone and style, would be Advanced Dungeons & Dragons rather than the Pathfinder Roleplaying Game. This really comes to the fore in situations where certain actions are described, but not given rules for and the sense is that a more complex game system, like the Pathfinder Roleplaying Game, would have the rules to handle them. That said, the advantage of the scenario being written for use with a retroclone like Swords & Wizardry means that The Demon Stones is accessible by any retroclone. Given the artistic and cartographical skills of the author, it not surprise that physically, The Demon Stones is a very well presented book. The artwork is good, though not always relevant to text where it is used, but the cartography is excellent, really very nicely done. The biggest problem with the text is the use of a stylised, serif font, which makes it a little difficult to read. A lesser problem is that it is overwritten in places and some of the text could have been tightened here and there. The Demon Stones is not a great adventure, but that should not be taken as a criticism. Rather, it is a good solid adventure, perhaps with too ordinary a plot, but this means that it is accessible and easily dropped into most campaigns. This is helped by the high standard of the maps, which are very good indeed. 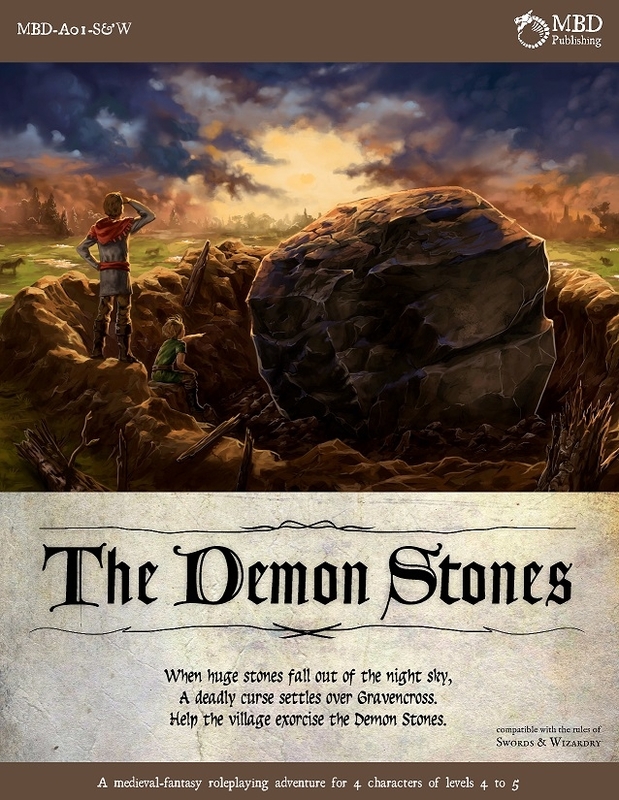 As first published adventure, The Demon Stones – A medieval-fantasy roleplaying adventure for 4 characters of levels 4 to 5 is a more than creditable attempt.